The excellent National Public Radio program, On Being, had a replay of an interview with Canadian philosopher and Catholic social entrepreneur Jean Vanier. I had heard this interview before and if anything, it was even more moving listening to it again. Vanier combines the best of Catholic teaching: a deep intellectual heritage, a strong prayer life and active social engagement. 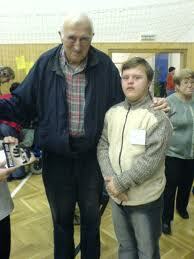 Considered by some to be a living saint, Jean Vanier created L’Arche. This model of community for people with mental disabilities celebrates power in smallness and light in the darkness of human existence. The French Canadian philosopher and Catholic social innovator speaks about his understanding of humanity and God that has been shaped by Aristotle, Mother Teresa, and people who would once have been locked away from society. Ms. Tippett (Interviewer): The story of L’Arche, which is French for “the ark,” began in 1963. Jean Vanier was a professor of philosophy at St. Michael’s College in Toronto. He had done his doctoral work on happiness in the ethics of Aristotle. At Christmas time that year, he went to visit a friend in France who was working as a chaplain for men with mental handicaps. Vanier found himself drawn to these human beings shut away from society. He was especially moved by a vast asylum south of Paris in which all day, 80 adult men did nothing but walk around in circles and take a two-hour compulsory nap. He bought a small house nearby and invited two men from that asylum to share life with him. This was not a linear move. Jean Vanier had entered the British Royal Naval College as a teenager and commanded an aircraft carrier in his 20s. At well over six feet tall with a head of white hair, he still has the bearing of a naval officer. He exudes an intriguing mix of intellectual intensity and extreme gentleness. When Vanier left the military, before he studied philosophy, he spent a year in a contemplative community in a poor area near Paris. L’Eau Vive, as it was called, “water of life,” was dedicated to serving the poor, praying, and studying metaphysics. I sat down with Jean Vanier in 2007, when he was 79 years old, to hear more about the life he’s lived and its lessons for our world today. And everybody laughed and he couldn’t understand, you know, why people are laughing, because it was, to him, a very concrete example. So he was a metaphysician. He was a thinker. He was really a man of God. And he was the one who encouraged me to do studies and encouraged me particularly to work on Aristotle. And the big thing with Aristotle is the primacy of experience over idea. A lot of people don’t know that. The worst thing that can happen is for Aristotelians to become Aristotelians, because then they start reading Aristotle, but they’re no longer in linked with reality — to touch reality, to listen to people, to see the world evolving and so on. Ms. Tippett: I know you’ve written that, from the point of view of faith, those who are marginalized and considered failures can restore balance to our world. Talk to me about that. Mr. Vanier: The balance of our world frequently is seen as a question of power. That if I have more power and more knowledge, more capacity, then I can do more. But does this tension between the doing and the being — and when you have power, we can very quickly push people down. I’m the one that knows and you don’t know, and I’m strong and I’m powerful, I have the knowledge. And this is the history of humanity. This entry was posted in Uncategorized and tagged Aristotle, Canadian, Catholic, Christ, Christian, compassion, faith, French, God, Jean Vanier, Jesus, Krista Tippett, L'Arche, love, On Being, philosophy, St. John, St. John the Baptist, suffering, vulnerability. Bookmark the permalink. Really great stuff! Thank you for sharing this…listening now. Hi Debra, I am glad you enjoy. The concept of an omnipotent, but vulnerable, God is one of the great paradoxes of Christianity. I thought Jean Vanier captures the concept beautifully. Yes, indeed. I especially liked when Vanier noted that the visitor at L’Arche couldn’t see past his own pity for the residents enough to see the joy that was in their eyes. (Something like that anyway…listening at work, so I am not able to be totally attentive). Jean Vanier was born into privilege as the son of the Governor General of Canada but he has a heart devoted to the Lord and followed God’s leading rather than enjoy the riches that our society has to offer. Jean Vanier’s family was also very gracious and generous to Henri Nouwen when he was writing and when he was at L’Arche Daybreak in Toronto. I have had the privilege of being at L’Arche Daybreak in Toronto at different times. Worshiping at Mass at L’Arche is an extraordinary experience for the core members (the people with intellectual difficulties) truly worship our Lord with their very beings and with great joy. After the commissioning there is a group of core members who do liturgical dancing with great joy and one cannot but feel the deep presence of the Holy Spirit. Lynda, you are extremely familiar with Mr. Vanier and L’Arche. I sincerely appreciate sharing your experiences. It sounds like you have had some wonderful experiences. I am late to the game but I am learning to appreciate the power of vulnerability. It is especially hard for me to do as I had spent the first half of my life, due to societal conditioning and self-protection to not being vulnerable. Undoing that false ego is both scary and enlightening. Your words are very encouraging. This is so important. For me, it is the heart of the matter. Thank you for reminding us of Vanier.